These Midwinter "Queensberry Stripe" pieces were actually thrifted a couple of weeks ago, but I have only just got around to photographing them. I often see gorgeous patterned tea and coffee sets, but they are almost always being sold as just one lot, and lovely though they are, dainty cups and saucers are no use to me as I greedily drink my coffee from a huge mug. Milk jugs and sugar bowls are just perfect. The jugs are easy to display on my kitchen shelf, and although no-one in this house takes sugar in their drinks, there are so many uses for little bowls. Everything about this pair is wonderful. I love the unfussy shapes, the pattern, and especially the colours. An added bonus is that they are in great condition, no cracks or crazing, which means I can use them without worrying that they will absorb water in the washing-up bowl. I was happy to pay £1.50 for the pair. In keeping with my current theme of coincidentally thrifting pairs of matching items, I am now able to very stylishly co-ordinate my neckwear and my milk jug. In theory, anyway - in reality I'm just not that kind of lady. 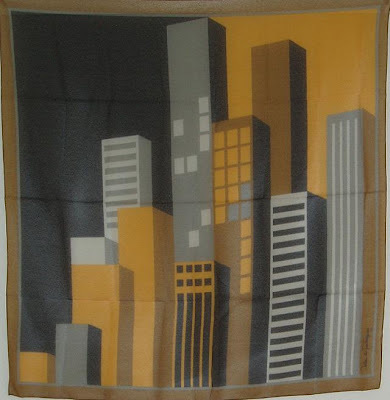 The colours and the strong graphic attracted me to this scarf, a 50p bargain. Love old wood - love storage - love this desk tray that cost me £1. This Wade owl family was from the same shop and will also be re-sold. It's lovely, but I try to avoid little trinkets that need dusting. Another bargain at £1 for the three. And finally, two real bargains at 10p each, although I voluntarily paid 50p each. On my local market there is a stall run by an elderly man who is raising money for hedgehog rescue. His goods are priced so low he can hardly make any money, I hope that the council lets him have the stall free as it's for charity. He is there every Friday, even in the winter when it was snowy, icy and bitterly cold. 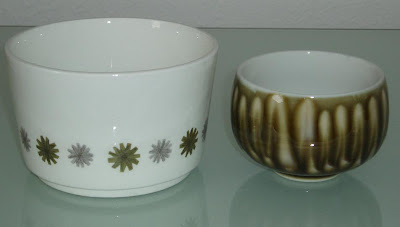 The sugar bowl is by Meakin - the Allegro pattern. It seems pretty huge for a sugar bowl, I can only assume that in 1964 everyone took at least 3 sugars in their tea. The other little bowl is unmarked (well, there's an unintelligible squiggle on the bottom). I love the shape, colour and glaze. I love milk jugs and sugar bowls too. We have film night in our house on a Friday and I hate the rustling of packets so I use sugar bowls for dips, peanuts etc. I bought a Midwinter Roselle jug and bowl this week. Love the pattern. 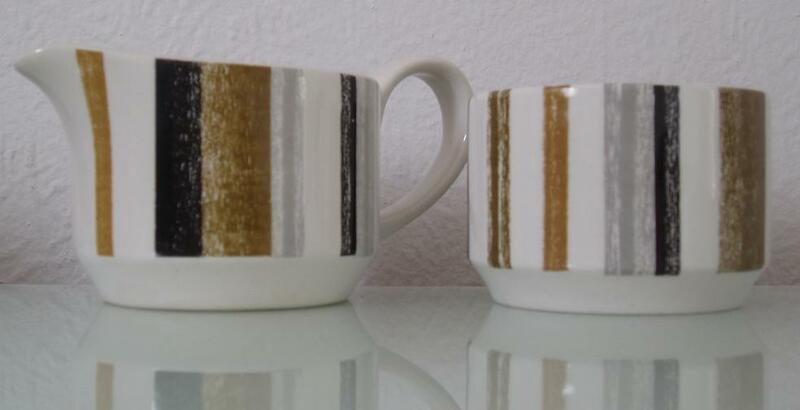 I have that Meakin Allegro one too. Oh bless the hedgehog rescue man, and well done for doing your bit for our prickly friends! Great buys, I love the first three. Owls... I don't know what it is with them, but I adore them (all, and the ones you found this week). Oh! 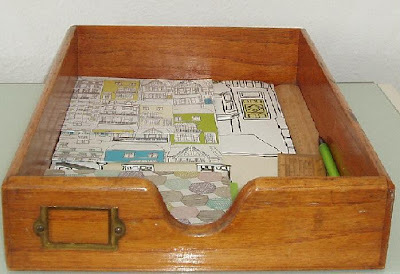 I adore the desk tray! That wood tray is so great! Love that little label holder. My dad has a couple oak paper trays and he just loves em. as usual lovely finds. The scarf is beautiful, it has this 1930's art deco look. Thanks for your encouraging comments on my blog, have a great week! I love the wooden filing tray. It seems to match my wooden filing box which I keep on my table. Ok, that's it. I'm jumping on a plane and coming thrifting with you. You know where to shop. Love the desk tray.